As many of you know Corbin is here this week for spring break. He is addicted to the show Chopped. I thought it would be fun for us to have a chopped night while he was here and last night we did. The first night he was here he made as he called it fake money totaling $22.530.00 for the winner to receive. 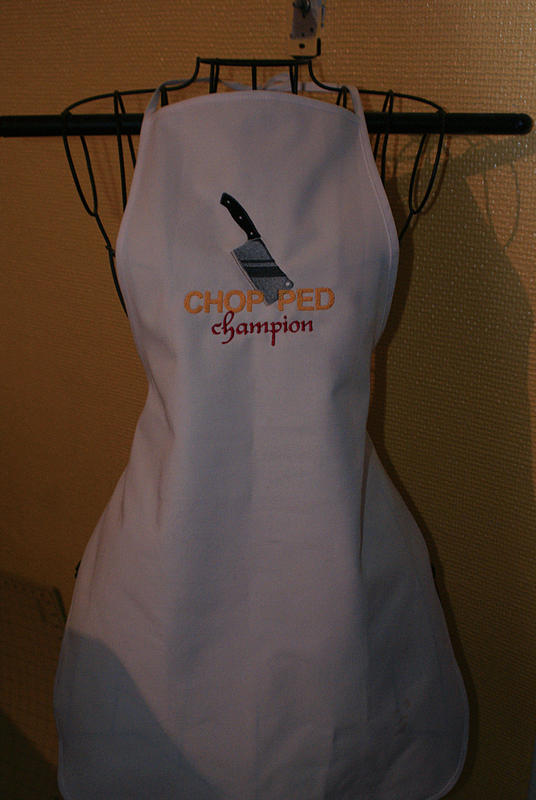 I made a Chopped Champion Apron. Corbin picked the ingredients for me and poppy and then I chose Corbins. He was real cute when we told him that we would have a chopped challenge and said well please give me eggs because that is all I can cook. Well for poppy he chose Tator Tots, Baked Beans and French Fry Seasonings. For me he chose Wiener's, Ketchup, Mustard and Onions. For Corbin I chouse Mac & Cheese, Eggs and Mayo. We knew that we were going to let him win. However, we did not have to let him. 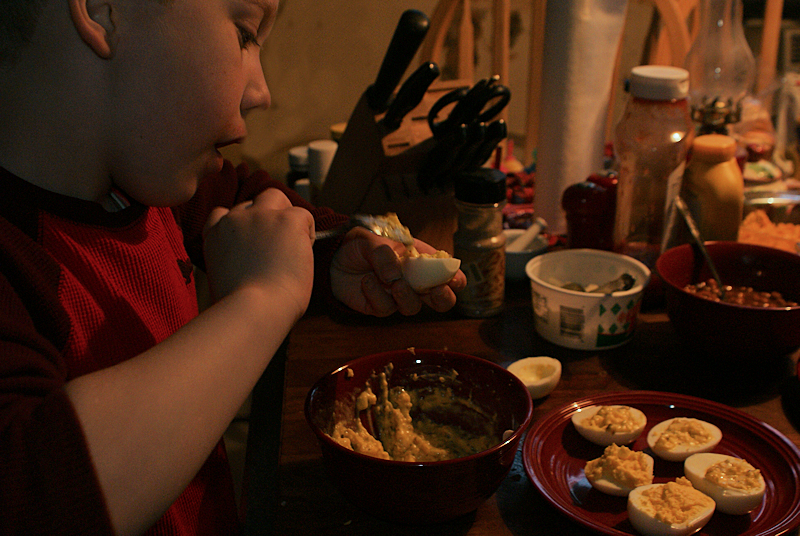 His deviled eggs and mac and cheese we better than what we had cooked. The wiener's I left cooking to long, poppy's tator tots were mushy. He did a fabulous job on both his dishes. 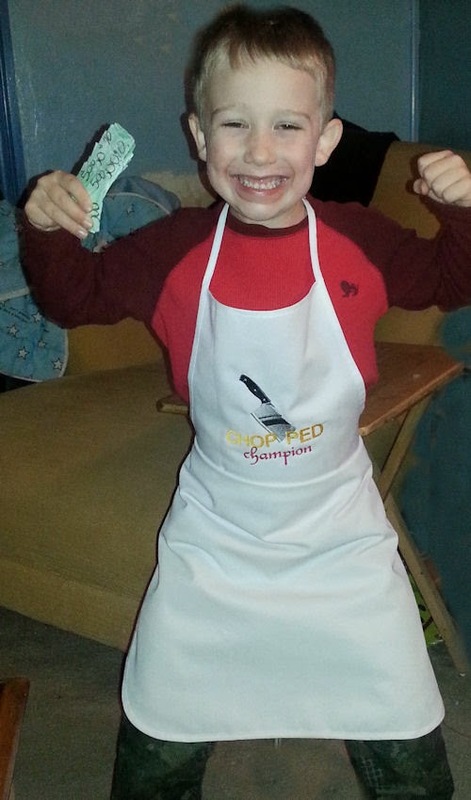 Here is a pic of him cooking, the happy winner and the apron. oh my goodness, how FUN! Corbin is adorable...look at that smile! He certainly is having a blast!! I am SURE you will all have a great week with his visit! The apron is awesome Nana! Yeah Corbin, way to go! Looks like you all had so much fun. What an awesome apron! 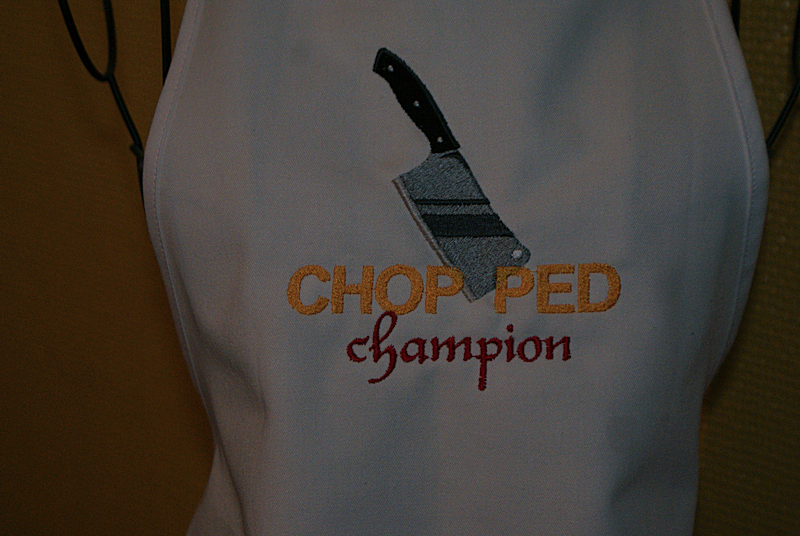 You did an excellent job embroidering the apron Nana! These pics are absolutely precious...he looks more excited than on the T.V. shows.Your apron is amazing and I hope you continue to enjoy these terrific moments. How about a photo of you guys with him ?! He is so adorable, Nana! Have a fab day!! !